Stratford Proper is a neighborhood Cafe and Bistro serving American Bistro fare made from scratch. Join us for Mother's Day Brunch! We will have brunch specials as well as our full brunch menu. Don't forget about $3 mimosas and bloody Mary's! The food was great as well as the service. Great menu, friendly staff, great beers. My new favorite "neighborhood" drop-in place. Comfort! Ordered the fettuccine carbonara and it was not good. Not anything like the carbonara I’ve had. The pancetta was way too salty and whatever they drizzled on to was not good. My husbands hamburger was raw. Couldn’t wave down a waitress to show her until the end. They did take it off our bill. The beet salad was chewy. Not good at all! Will not recommend to others. This was our first dinner at Stratford Proper. Everything from the appetizers to the entrees were outstanding. The pear martini is to die for... Karen C. was our waitress - she's so knowledgeable, personable, and effortlessly gracious! She elevated what was already a great evening! Our party of four sampled many items from the menu, as well as a couple of beer recommendations, and of course the martini. Excellent food. Wait staff was very knowledgeable and helpful. Great value as well. A great successor to Per Noi in this welcomed neighborhood eatery space. Small and away from busy venues, this is a delightful small haven for great food at a good value. Mussels in a fennel cream sauce are uniquely delicious, Truffle fries a not common variation on pomme frites and the Carbonara pleases the palate. Hooray for this addition to the Proper family with its great microbrews. First time there, we will definitely be back. Great food, Great service, looking forward to eating outside. Hi Tlee, Thanks for letting us know about your recent dining experience. We will hopefully be open for patio season next week - fingers crossed. See you again soon! Meal was wonderful! Love the neighborhood vibe. Our waiter was very attentive and had good suggestions. Loved the meatballs with raisons and pine nuts. Really good food with healthy options. Can’t wait to go and sit out in the patio space next time. Great find! Nice neighborhood spot for an upscale meal. Great beverage options and an interesting menu. The atmosphere is very simple, it could use a bit more decoration to warm it up a bit. Was excited to try the new location. I had heard reviews. I can understand why they are mixed. Location is great. They’ve done a nice job with the space. Our server was obviously new. She was a little frazzled. No problem with our reservation. Walked right in and seated. The food is unimaginative. Pretty basic stuff. There were 6 of us. 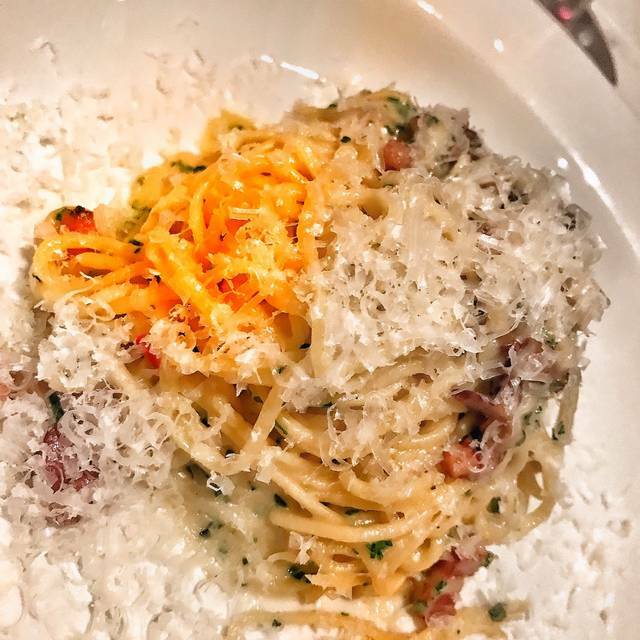 Dishes were carbonara - bland, dry and served lukewarm. Sirloin with funeral potatoes - served very rare and everything was lukewarm and had been under heat lamp. Rolled deli meat. No cheese. No bread. Not good and between the 6 of us didn’t even come close to finishing it. The grilled vegetables were okay. The men didn’t care for them but that may be because they are men and anything green probably isn’t good. The women liked the veggies. The baked Brie was the best of everything we ordered. But 5 slices of water thin apple is not enough to compliment the large serving of Brie. And when you have 6 diners why bring 5 slices of apples. Oversight on the servers part. We didn’t order desert. Prices are fair. We brought our own wine so I can’t comment on the wine list. We probably won’t be going back. Just didn’t wow enough to justify another trip. Great place to have in the neighborhood. The food was delicious and beautiful. Great service. They gave us a complimentary pickle plate when one of the entrees was late. I like that you can also get a 12 oz. glass of beer instead of a whole bomber. Looking forward to al fresco dining the summer! They need to do something about the noise level. It was so loud my friend and I just wanted to get out of there. Food is good and employees seem very nice and helpful. Food is very good. I hope the correct the noise issue because I want them to stay around. Definitely worth going back. We will put this on our regular dining rotation. Very nice! The waiter was excellent and the atmosphere was very welcoming. My mushroom ravioli dish had a soy sauce that was very salty! There was a lot of the sauce so it was hard not to notice. Other than this we enjoyed the warm beet salad and pasta carbonara. We will go back! The service started out excellent but then diminished once our meal was served. It seemed that our server was taking one whole side of the restaurant. We ended up getting dessert to go at the front desk. The food was really good. Very noisy on a Friday night at 8 pm. Reservations are a must! I saw people waiting at least an hour for a table. It seems the restaurant is looking for an identity. The menu items were all over the place. It was an ok experience but I'm not quite into spending over $60 for an OK experience. The desert that we had, brownie w/ice cream & raspberry sauce, was disappointing. The brown was stale and there wasn't much ice cream on top to make it a little more tastier. Amazing food combos. Very fresh. Great service and ambiance. I want to go back! Hamburger that was supposed to be rare, was very well done, small patty. Food just really very so-so. Arugula salad was the best thing. My husband and I had an early dinner this past Saturday. Atmosphere and ambiance calm and soothing. Noise level very minimal. Granted we were one of several customers due to early hour. I would describe decor as minimalist and clean, kind of industrial blank slate feel. We were waited on promptly and all wait staff were very attentive with taking our order and keeping glasses filled. My husband had the Bistro burger which he said was very good and enjoyed a great ale with it. 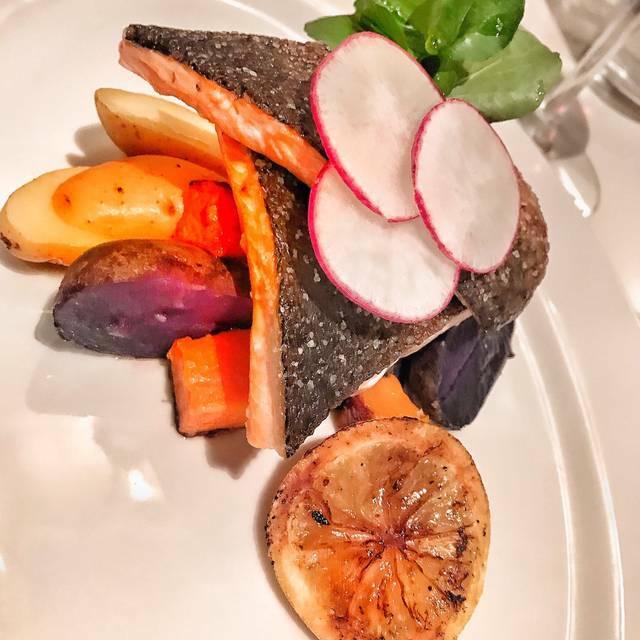 I had the trout with fingerling potatoes. The trout was exquisitely cooked! Melt in the mouth tender with an amazing saltiness and slight crispiness to the skin! Well done chef! Possibly the best trout I have ever had and I like trout. Enjoyed a sparkling Spanish wine which was a good contrast with the fish. Focaccia and olive oil appetizer was excellent. Light, flavorful airy bread went well with the olive oil and balsamic. Overall very nice experience. This place is amazing. It is a neighbor Cafe with a quiet charm. The wait staff is very friendly and knowledgeable. The manage, Billy, could not have been nicer and attentive. The food was fantastic. The mussels were the best I have ever eaten. The Hush Puppies were also amazing. I had the Bistro Burger, fantastic and very filling. The deserts are to die for. I would highly recommend Stratford Proper Cafe & Bistro for any reason that you might have to enjoy a great night out. 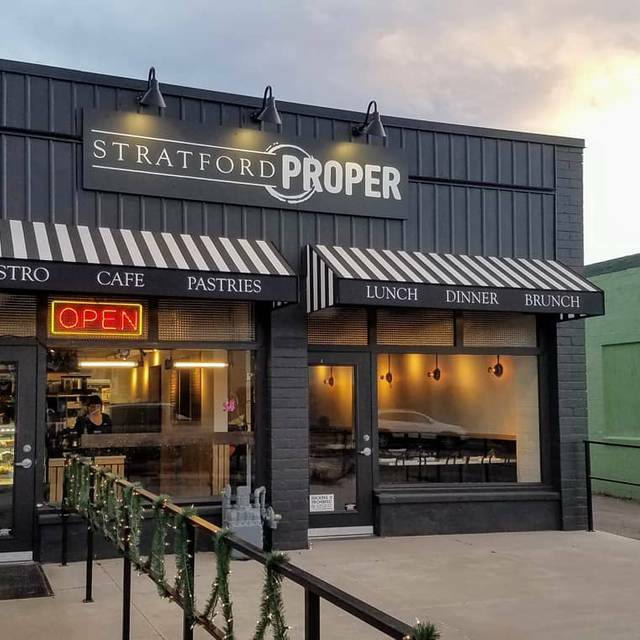 We loved our experience at Stratford Proper. The service was fast and friendly. The food and drinks were fantastic. My boyfriend had the burger with brie cheese and candied bacon (highly recommend adding it) and it was moist and perfectly cooked. The french fries are some of the best we've ever had. I had the beet salad and added steak. Great portion size and my steak was cooked exactly as I asked. Try the Rolls Royce cocktail for dessert. So delicious! So happy this gem is in our neighborhood. We will be back. The food, cocktails, and service were all exceptional. Will definitely be returning. Valentine’s Day date with reservations. Had a great time, good service and drink. I would definitely return. Stratford Proper ably fills the void left by Per Noi’s success and departure. 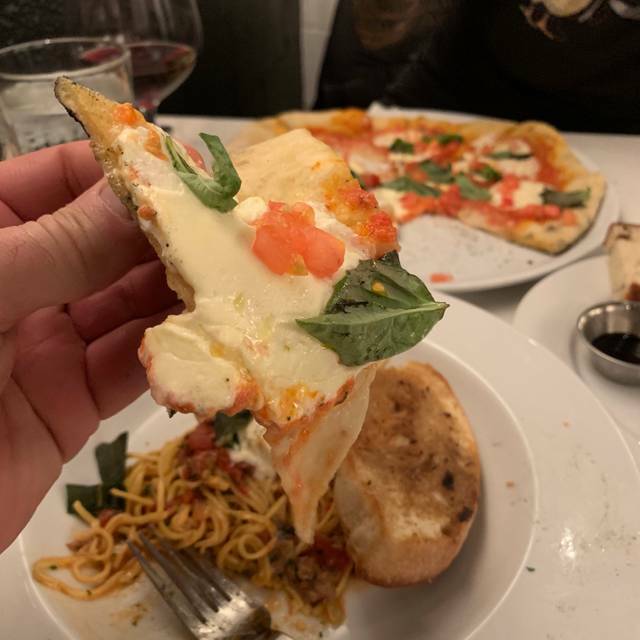 This remains a very good restaurant offering in a low traffic neighborhood, honoring both the Per Noi and Italiano legacy and the growing Proper reputation. The rather simple menu is well executed and the value is outstanding (Park City chefs take note). 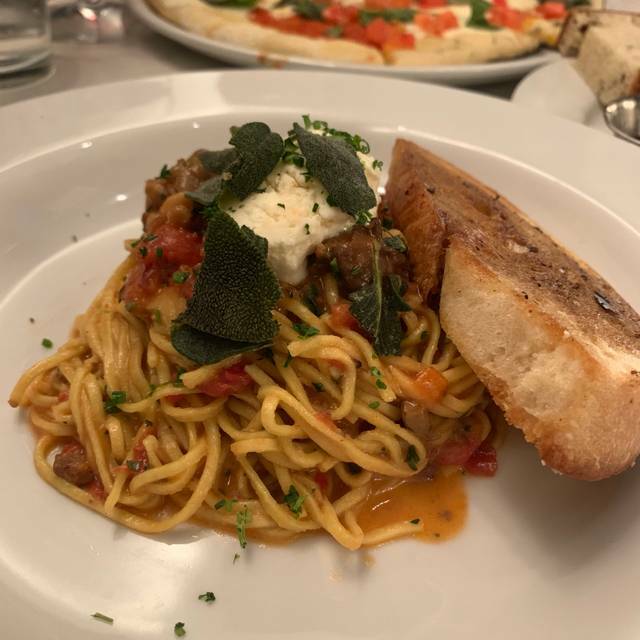 The eatery is new so they’re forgiven for a too dry Carbonara (generous with Pancetta) but their mussels in a fennel cream are arguably the most interesting and delectable preparation along the Wasatch Front. This place can only get better. Very cool place with great food. We went there on Valentine's Day, the service was fantastic, the food was amazing and we will definitely be back. The food was inedible, we are not exactly picky eaters and like dives as well as fine dining like Valter's. The pizza was burnt and had no good flavor the carbonara had a terrible taste. I'm not talking bland, I'm talking about something so bad that I was starving and still didn't want to eat it. The staff was very kind but I don't think we'll be back. Great dining experience. We were seated promptly upon arrival. Our waitress, Laura, was wonderful. She was very friendly and gave excellent recommendations. The food and drinks were excellent. The menu was interesting and varied. . The pesto pizza was very tasty and more than enough for one person. The flavor of the gnocchi was lovely but the gnocchi was a bit mushy. It would be a nice addition to have some artwork on the walls. I will definitely return in the future. I’m glad to have Proper in my neighborhood - the food is good and reasonably priced. However, the atmosphere is pretty austere and the noise level is ridiculous. It was a Saturday night and the place was full. We could not hear a word our server said and had to ask her to repeat herself several times. If the place is not crowded, then it’s pleasant enough, but I doubt I go back on a Friday or Saturday evening. I thought the food was only fair. And not cheap. The noise is so bad you have to shout at your guests. Nice, quaint restaurant, but the noise level was extremely high. You had to shout across the table so your dinner guests could hear you. Second time in a week that we ate there. First time, on a Tuesday, it was serene, little noise, food was perfectly cooked. We had a long talk with our waitress. Second time, Thursday night was sheer bedlam. Waited for table even though we had a reservation, waitstaff practically running to service everyone, food was over prepared, etc. Great place. They just need to be ready for crowds. I’m still dreaming about the food! Service people warm and helpful. Loved it! We had reservations but were placed in the back corner table next to the bathrooms while the folks seated after us were given better tables without reservations. We had a beet salad as a shared appetizer which was very tasty. Our mains were a hamburger which had very dry buns, the fries were great, and then the other main was the squash gnocchi. The gnocchi was mushy, overcooked and the squash very under cooked, the flavor was very nice. Overall quite disappointing as we live close by and walked there. We were hoping to have a local eatery to enjoy but with the very limited menu and experience this first try I don't think we'll go back again.